My dream camera. I have been waiting for this for a very long, long time. I wonder how many $$ it takes to get a functional set? When and how can I preorder this? And no DR mentioned. Apparently the sensor is little larger than S16. Micro cinema for me. With such a small Micro Cinema Camera design, we quickly realized that if we removed the built in recorder and digital film sensor cooling and replaced with SDI connections and a 4K video image sensor, we could build a really small studio camera for live production! 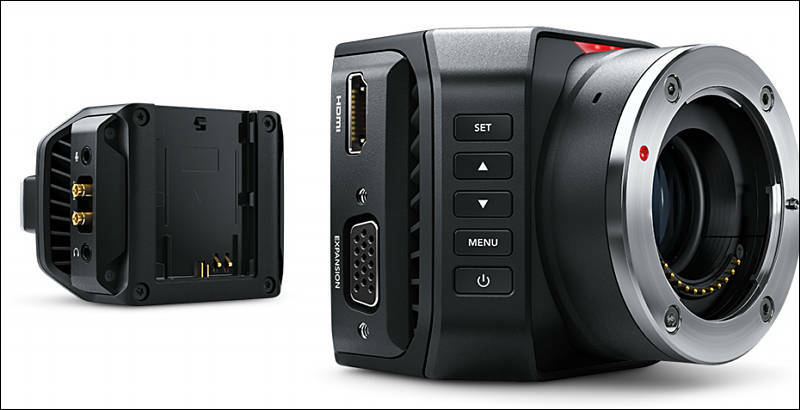 The Blackmagic Micro Studio Camera 4K looks the same as the new Micro Cinema Camera but it’s really a completely different camera because its a broadcast quality Ultra HD studio camera! Although you can use it with an external recorder as a production camera, it’s really designed to be used in live production with a live production switcher. It has an Ultra HD sensor so it works in native Ultra HD and of course with a sensor at that high resolution, it makes an incredible HD camera also! Because it’s a live camera, it’s features are almost identical to our Blackmagic Studio Camera 4K. It has SDI in and out, a built in color corrector and all the control to the camera can be sent via the SDI input so it uses the same SDI control protocol as our studio cameras and ATEM switchers. It uses 6G-SDI, so supports all Ultra HD frame rates up to 30 fps, but it does 1080 HD frame rates up to 60 fps using the full sensor size. It includes an expansion connector, but it’s also different. This camera has a PTZ serial connection out and this can be used for controlling a remote head. Any pan, tilt and zoom commands sent to the camera via SDI from the switcher will be output on this PTZ connection and if you have a zoomable MFT lens, it will adjust the zoom on the lens as well. Also on the expansion connector is a B4 lens control connection so we can control broadcast lenses. We have been asked for this a lot by high end broadcasters and now with this camera and the B4 lens connection you can use add accessories to turn this camera into a fully featured studio camera. Imagine using it as a full sized studio camera with external monitor and broadcast lens. Or using it on set concealed so you can get all kinds of exciting and interesting camera angles! The Blackmagic Micro Studio Camera 4K will be available in July for $1,295. Plus they are now covering niches. Read their camera names and camera pages all is in bold big letters. In that test dont I look anything special. @dlzn , why are you excited??? It is of next to no interest to filmmakers, only mainly of use if you do that kind of studio work (or similar). Got an ATEM as well to go with it? If not, I'd suggest passing on this.